Discovering the truth about ourselves isn’t easy. Too often we suppress our emotions, leaving them dormant in our minds awaiting to pop out at us when we are most vulnerable. I know firsthand – I’ve spent most of my life avoiding my feelings. My father was murdered when I was fifteen-months old, and I traveled through life imagining it didn’t bother me. I told myself things like, “I was too young to remember him,” and “I never knew him so there’s no way this could affect me.” Little did I know this resistance was shaping itself inside of me forming a home within my identity. From this root of resistance grew weeds of beliefs about myself and others. Faceless fears crept and spread into my consciousness from the time I started walking and talking. I perceived myself as lacking – particularly a father – and acted out accordingly. As a young child, as far back as I can remember, I had temper tantrums often enough to warrant concern. It didn’t matter the cause, anger was always the effect. When I was fifteen-years-old, my mother remarried. My new step-father had three children of his own, and they lived with us. We moved from the city to the suburbs. I left my small all-girl private high school and started a large co-ed public one. Though my parents’ intentions were good, these changes only added to my troubles. I experimented with drugs and alcohol, was rebellious towards authority and always ready for an argument. Eventually I matured, graduated college, started a career, married and had children – but those fears without a face remained. Every so often, usually during stressful times, they surfaced and senseless tirades ensued leaving me and those involved mentally battered and physically exhausted. My life was like any other. It had its unforgettable moments, joyous occasions and unexpected changes. Yet uncontrollable bouts of emotional upheavals, though they were less frequent and less dramatic, continued to lurk into my thirties. In the meantime, I prayed and searched my soul continuously. I turned to God during the aftermath of my episodes and felt a loving presence pushing me onward, keeping me hopeful and on the road to healing. Journaling was the vehicle that brought me there. It’s the one place I can be completely honest without worrying about judgment or acceptance. I can write how I really feel – the good, bad, ugly and everything in between. It allowed me to process these feelings in a patient, kind and loving way. My soul searching led me to the book, A Course In Miracles, which led me to a class about the book, which is where I learned how to journal. The teacher, a woman of wisdom and unwavering perseverance, taught how journaling allows us to view our minds – like looking through a window at ourselves. It provided a way for me to witness my thoughts and go deeper into myself than ever before. I came to understand myself and recognize my fears. But, most importantly, it brought me to the source of my fears – my own perceptions. I thought what I perceived in my mind was true. I believed my perceptions, and I wore these beliefs like the shirt on my back. They created my self identity, and every action, every decision I ever made branched from them. And, when they were in threat of being revealed for the small insignificant ideas they were, my ego retaliated to protect them and keep them powerful. The first step is committing to journal every day, at least thirty minutes per day. Choose a convenient time and comfortable place. Start with the immediate things troubling you and weighing heavy on your mind. Be completely honest with yourself. If you feel yourself resisting to write the truth, that’s a strong indication there’s something there that needs examining. Be brave – write it down, allow it to surface, allow yourself to feel it. Allow yourself to feel it. This merits repeating because we sometimes tell ourselves, “I shouldn’t feel this way. It’s wrong. It’s not nice.” Or, you may not want to feel it because it’s too painful. Unless you acknowledge it, it will remain in your mind creating havoc until it’s acknowledged. Then ask yourself what past events led to the birth of the emotion. What was the cause? What is the fear? All negative emotions have one common root – fear. The fears we avoid have the most power in our lives. Depression equals fear. Anger equals fear. Lack of confidence or self worth equals fear. The emotions may differ, but the cause is the same – some sort of fear holding us back, keeping us from the truth. In my case, the fear was lack of self worth. I was afraid I wasn’t good enough. The goal is to recognize these fears – know what caused them and bring light to them. You’ve relentlessly journaled about your emotions and discovered the source. Hopefully, you’ve also discovered beliefs you created. For instance, my lack of self worth came from the belief that a family had a mother and a father, and since I didn’t have both I was different. Where did that belief come from? It came from my perception that told me a “family” has two parents. What’s stranger than this is the more I heard a “family” is anyone who loves you, the less I believed it, because if that were true no one would have to convince me of it. See how perception works? It’s perception that shapes our beliefs about ourselves, others and the world around us – but it can’t see the whole picture and is always relaying a limited view. That’s where forgiveness comes into play. We’ve been terribly wronged. Something or someone has hurt us. My father was murdered. My mother remarried. “Woe is Me” was my life’s tune, and I was justified. Who wouldn’t agree that these situations were troubling for a young child? Feeling justified is the gavel perception slams down in its defense. Perception tells us, “Continue suffering, it’s okay, we have good reason.” So we relive our dramas, or traumas over and over again in our minds and act them out in our lives. Forgiving those who wronged us is only the stem of the flower of forgiveness. For forgiveness to bloom, we must also forgive ourselves. Why would we need forgiving? Simply because it’s in our own minds where the pain resides – we must forgive ourselves for choosing to continue to suffer long after the incident has occurred. Once you’ve decided to forgive yourself for holding onto those perceptions causing you suffering, a healing begins to happen. You take responsibility as the thinker of the thoughts causing you pain. You become aware suffering is in your own mind, and now you have a choice. We’ve committed to the process, we’ve forgiven ourselves, and now we must make the conscious choice to let go of our perceptions. Surrendering is not weakness – it’s empowering our minds to choose not to suffer and let our past be released to the past – where it belongs. We’re surrendering all that is toxic in our minds. I had to accept the brutal truth that all the hurting I felt wouldn’t change the fact that I grew up without my father. I also had to accept that the emotional pain I experienced throughout my life was from my own perception of myself as a victim. The knowledge of what we have endured doesn’t go away, but we become free of the pain. In surrendering our thoughts and feelings by witnessing them in our journals we rise above to see a clearer picture of our emotional selves. Journaling allowed me to see I was perceiving myself as a victim. It was this perception I fought to protect whenever I felt vulnerable – seeing myself as a victim entitled me to acting out my fury. Journaling uncovered the layers of self-beliefs preventing me from living in the present. My journey began with recording daily discomforts but eventually led to a much different path of self discovery. It brought my suppressed pain to the surface and shined a light on it to reveal its hold on my mind. I no longer see myself as a victim – I’m free of that perception and free of the need to protect it. Now I know I’m worthy of all the good God intended for me. Great masters like Jesus and Buddha taught how knowing ourselves leads to the discovery of who we are, clearing the way for our higher selves to come forward with clarity. Now a new dawn of consciousness can begin to take place inside of us, putting us in control of our minds and not the other way around. Don’t judge your problems as too big or too small to be helped by something as simple as journaling. You’d be denying yourself the opportunity to get to know the most important person in your life – YOU. 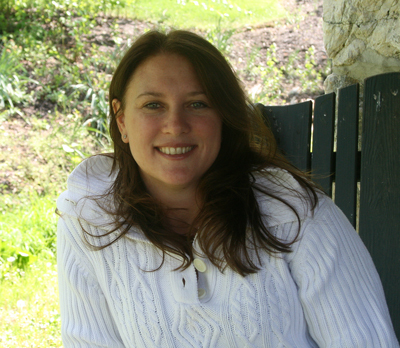 Sharon Carmichael is a freelance writer and holds a bachelor of arts degree in English Literature. Her work experience includes copywriting and editing for a marketing agency creating slogans, marketing materials, and advertising brochures for companies ranging from small businesses to Fortune 500. Sharon is happily married. Her two children (ages 15 and 11) and her pup, Pinot, are the joys of her life. She is committed to bringing about wholeness and healing into people’s lives. Her inspirational insights and guidance are available at www.askannswan.com – a small website she maintains under her pen name, Ann Swan. Many journals “started” in my lifetime. Thank you for being such an inspiration Sharon! I wish you all the joy and success in your endeavors to help others evolve!! I KNOW that you have been an inspiration to me. GREAT ADVICE! I hope I have the discipline to journal. I am printing your article and will read it everyday for inspiration! I truly believe God has blessed you with a wonderful gift. It is great that you are sharing this gift so other can also profit. Keep up the great works. So proud of my very special inspirng friend!